I haven’t posted for awhile, but finally am finishing the drawing of a Pileated Woodpecker feasting on bugs from a dead tree stump. The last stage involved watercolor washes to support the line drawing or the contour. This stage shows gradations of colored pencil to provide a more subtle clarity to the picture and some pen & ink to allow for more drama. It is a riot of color now as the orange leaves swirl about the bird. I am working with this type of mixed media to spur me towards a more free approach. I still have a ways to go!! Any advise or input would be welcomed! I appreciate the feedback; I’ve done more blending of the feathers so they support the shapes of the wing, back, breast, and lower areas instead of acting as separate entities. Amazing bird with an awesome call; a rather prehistoric shriek! Jake, thanks for the encouraging words. I’m pairing watercolor with drawing to work on a looser approach. Still a ways to go!! 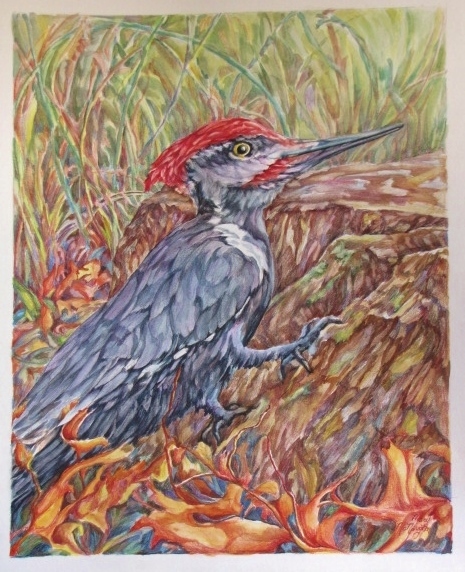 You are currently reading Finished Stage of The Pileated Woodpecker at Dr. Mary McNaughton and Drawing.